Light, crisp and delicious! 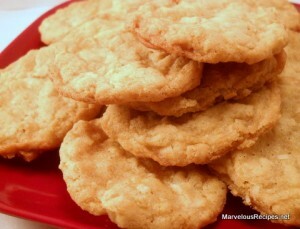 The cookie lovers in your family will gobble these up in a hurry! In a medium mixing bowl, combine the flour, oats, coconut, baking powder, baking soda and salt. In a large mixer bowl, combine the butter, granulated sugar and brown sugar. Beat at high speed of mixer until light and fluffy, scraping the bowl occasionally. Add the egg and beat until blended. Add the flour mixture and mix well. Shape into small balls. Place the balls 2-inches apart on an ungreased cookie sheet; flatten with a fork. Bake at 375 degrees F for 8 to 10 minutes or until light brown. Cool on cookie sheet 2 minutes; transfer to a wire rack to cool completely. Makes 5 dozen cookies.